DOTTY: (female) Woman who dreams of being on television. REPORTER: (male) TV reporter who interviews random people on the street. REPORTER: Pardon, Miss, but you’re on live television! DOTTY: I thought this was a bus stop? REPORTER: Well, ladies and gentlemen, here we are again with “your man in the street” telecast, the program that brings you commentary by ordinary citizens on the vital questions of the day. Here’s a young lady waiting for a bus. I’ll see if I can ask her a few questions. 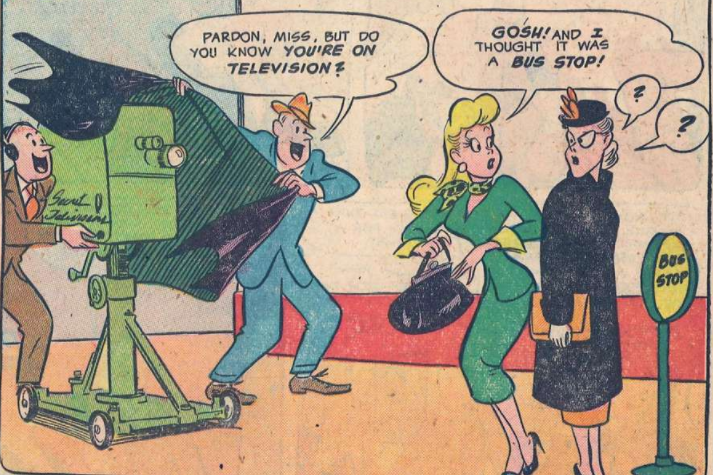 Pardon, Miss, but would you like to be on television? DOTTY: On television? Oh, I’d love to! REPORTER: Fine! Step right here in front of our camera. DOTTY: I wonder if I’d look better with my hair up? I should take this bow out of my hair. And a little more lipstick. REPORTER: Please, miss. That really isn’t necessary. DOTTY: It certainly is. A girl has to look her best for her big break in television! My whole career might be riding on this. I can’t ruin my chances. REPORTER: But this will only take a moment. CAMERA OPERATOR: Forget it. The studio went to commercial. Let’s talk to someone else. REPORTER: How do you do, sir? This is “your man in the street” telecast. May I ask your name? DOTTY: Hi! My name is Dotty. CAMERA OPERATOR: Hey, lady! You’re too close to the camera. REPORTER: Excuse me, miss, but we’re interviewing this gentleman now. DOTTY: You asked me to be on your show and now you cast me aside. It’s Hollywood wolves like you that girls have to be careful of these days. You and your empty promises of fame and fortune. “Be on my television program! I’ll make you a star!” Promises! Promises! That’s all they are. DOTTY: There! That proves you’re a snake! Calling me crazy in front of millions of viewers! Pretending like you don’t know me, like you’ve never seen me before. REPORTER: Are we still live? Why didn’t you cut? CAMERA OPERATOR: This is great stuff. DOLLY: Now, you’re saying I’m a bad actress too. DIGBY: Are you okay, miss? Did this man do something to you? DOLLY: Girls of America, beware! Remember this face! Don’t let his serpent tongue trick you as it did me! DIGBY: He deserves a good thrashing. Let him have it, miss. REPORTER: Cut the camera feed, you idiot! Someone please remove this woman!